How prepared are you for tax time? 30th June, the end of the financial year is drawing close and to help you prepare here are our top 7 tips for your 2015-16 tax return. Please note that this list is not exhaustive, and we will need to review the items in light of your personal circumstances. We will need to see your dividend statements, which will identify the dividend payment date and the type of dividend payment for your Australian company shareholdings (that is, fully franked, partially franked or unfranked). You will also want to keep in mind that some companies pay interim and final dividends, so you will also need to provide these statements to us. Both the dividend payment and the value of the franking credit (if applicable) are included in your assessable income on a receipts basis. Terminology on the dates may be confusing for some, but we can quickly clear this up for you. Use the payment date rather than record date to determine when you received the dividend. Please note: You will need us to determine this for you as sometimes these may straddle two different financial years. What’s more, franking credits are applied against your gross tax payable as a tax offset and the excess typically refundable where your tax liability is less than the total franking credits (after taking into account any other tax offsets). If your taxable income is less than $18,200 this financial year and you receive franked dividends, we can still make a claim for you for the refund of those franking credits. To do this we will most likely help you fill in a Refund of Franking Credits form (this can also be done for previous years if you haven’t already asked us to do so). If you have investments in managed funds or stapled securities, we need to review each distribution statement for you as there may be dividends and franking credits, foreign income and taxes, as well as capital gains and losses shown. Be aware of foreign taxes paid on offshore income, as we may be able to claim foreign income tax offsets for you (which can be claimed against your tax payable). However, unlike franking credits, if you cannot use them in the current year, you lose them. If you have invested in a quasi-business activity (such as a hobby farm or venture), and you have generated losses this year, you cannot just deduct the loss against your other income (such as salary and wages). Unlike negative gearing on property and shares, you are required to quarantine these losses for later use unless you satisfy specific criteria. Please note: Your “adjusted taxable income” must be less than $250,000 otherwise these losses are quarantined. These rules are complex so contact us if you need help. 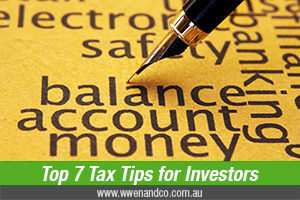 Don’t forget to tell us about all your investment-related deductions so we can further reduce your tax bill. But remember, these are available only if your expenses are directly related to generating your investment income. Make sure you have all necessary receipts or credit card statements in order to substantiate claims, but don’t hand these over to us yet — we’ll ask if they’re needed. Further, where you have used your own car for travel related directly to your investment income, such as visiting your stockbroker or attending AGMs, you can claim a deduction for costs incurred. Note: There are special rules for claiming car expenses (and we can help you with all these claim details). Immediate deductions can be claimed for depreciating assets that cost less than $300 and are mainly used to earn your income. Otherwise, we can claim depreciation for you on the asset by using rates prescribed by the ATO. We may need to ask you about the extent of any private use. Make sure you let us know if you want to claim a deduction for membership associated with your investments (you may, for example, be a member of the Australian Shareholders Association). Where you gain investment income, the entire amount of the subscription can be claimed as a deduction if the membership is relevant. Otherwise, the deduction is limited to $42 for each membership.